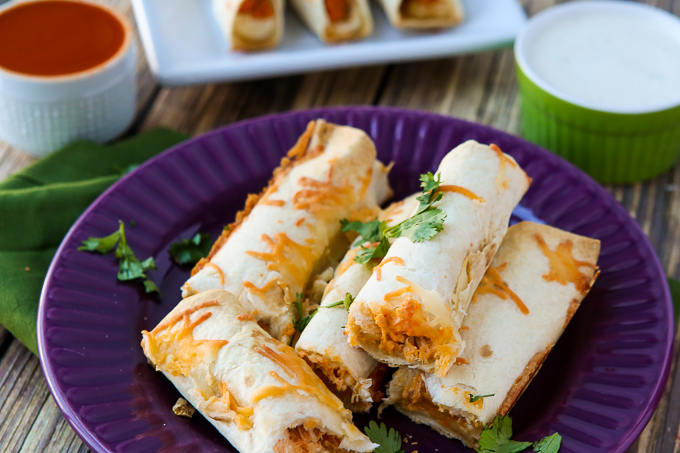 These baked buffalo chicken flautas are the perfect game day food – easy to make, a little spicy, and delicious! 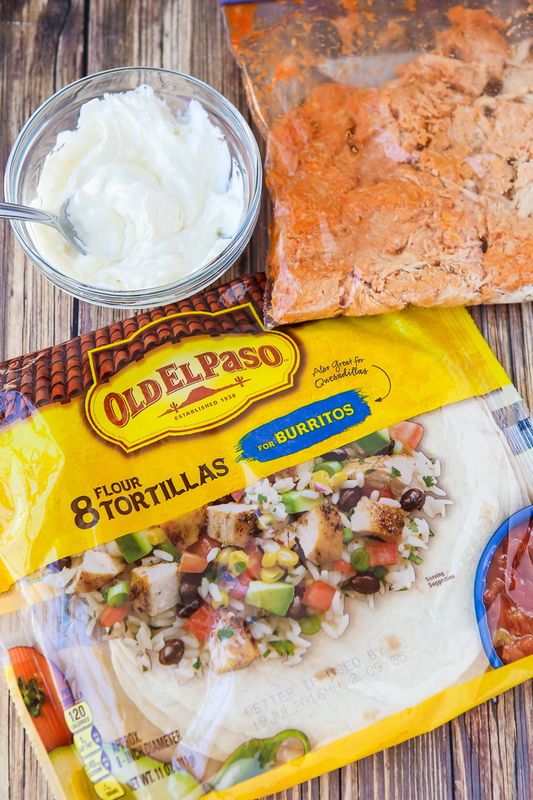 I’m so excited to be teaming up with Old El Paso™ to bring you this yummy recipe! Anyone else getting excited about the big game coming up in a few weeks? Not only do I love a good football game, but I also love game day food! 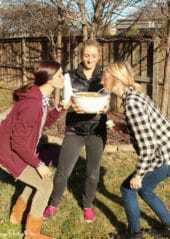 One of my favorites is my family’s buffalo chicken dip. It’s one of those recipes that we all make but there isn’t really a written recipe for it, just ingredients that all taste great together no matter what measurements you use. One of the best things about the buffalo chicken dip is that it’s actually a great filler for pretty much anything you want to put it in. 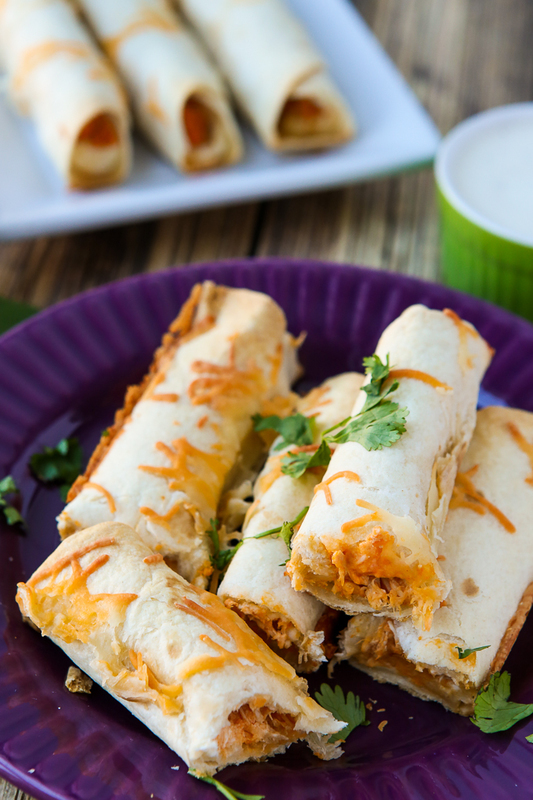 I made some buffalo chicken cups a couple of years ago and today I’m sharing a new favorite – buffalo chicken flautas. Or if you’re not familiar with flautas, buffalo chicken dipped rolled in Old El Paso flour tortillas and baked until crispy. 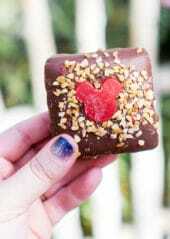 And they’re delicious. Anyone else getting excited about the big game coming up in a few weeks? Not only do I love a good football game, but I also love game day food! 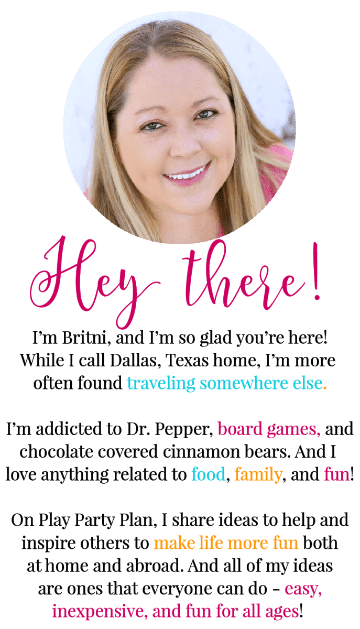 One of my favorites is my family’s buffalo chicken dip. It’s one of those recipes that we all make but there isn’t really a written recipe for it, just ingredients that all taste great together no matter what measurements you use. One of the best things about the buffalo chicken dip is that it’s actually a great filler for pretty much anything you want to put it in. 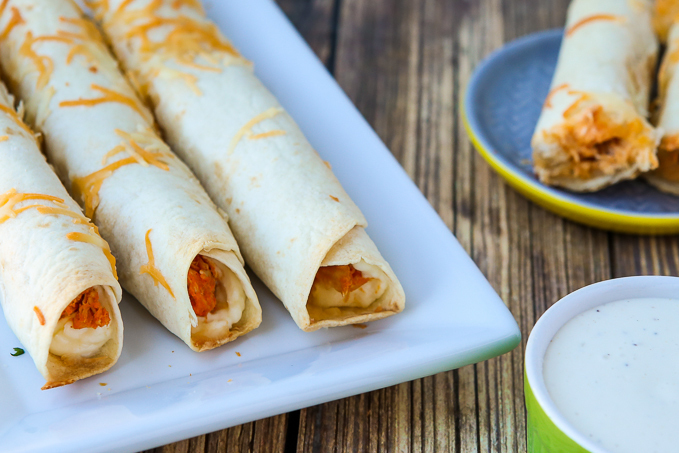 I made some buffalo chicken cups a couple of years ago and today I’m sharing a new favorite – buffalo chicken flautas. Or if you’re not familiar with flautas, buffalo chicken dipped rolled in Old El Paso flour tortillas and baked until crispy. And they’re delicious.First things first, you need to get all of your ingredients. I headed over to my local Safeway last week to get everything I needed for this past weekend because there was supposedly a little snowstorm headed our way. The Safeway closest to me is pretty new and always stocked with everything I need, including the five ingredients you need to make these flautas. I found the Old El Paso flour tortillas I was looking for in the Hispanic foods aisle with a bunch of other great Old El Paso products. I specifically like the Old El Paso tortillas in these flautas because they’re a really good size for flautas – not too big and not too small. Kind of like Goldilocks’ porridge you could say. Man am I glad I ended up getting everything I needed before the snowstorm, or should I say snowzilla, hit. We ended up with three feet of snow and are still digging ourselves out. 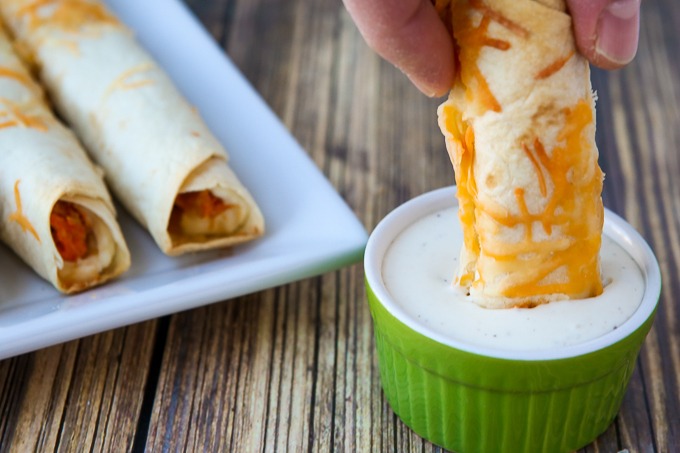 Good thing I had these yummy game day flautas to keep me company during the exciting football games this weekend! 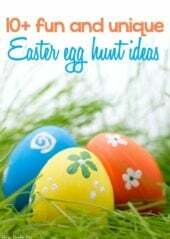 I can’t wait to make them again in a few weeks, and I guarantee if you make them, your guests will love them! 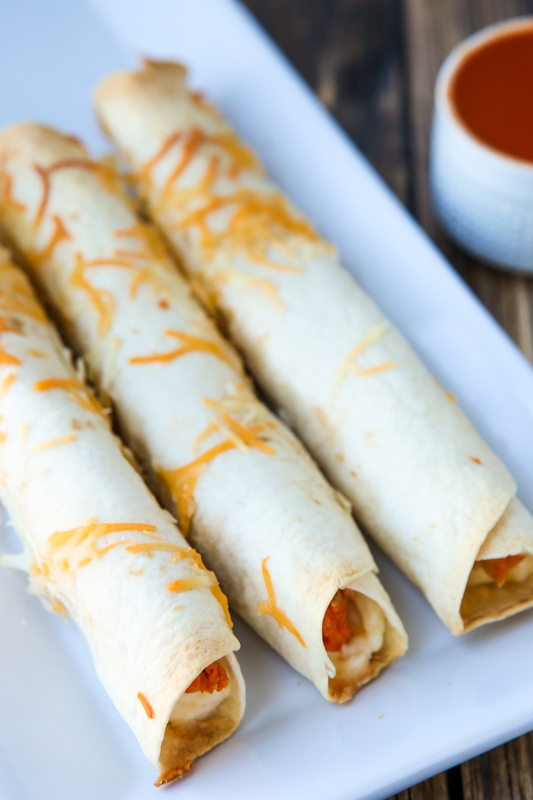 Check out the Old El Paso website for more great game day recipes! 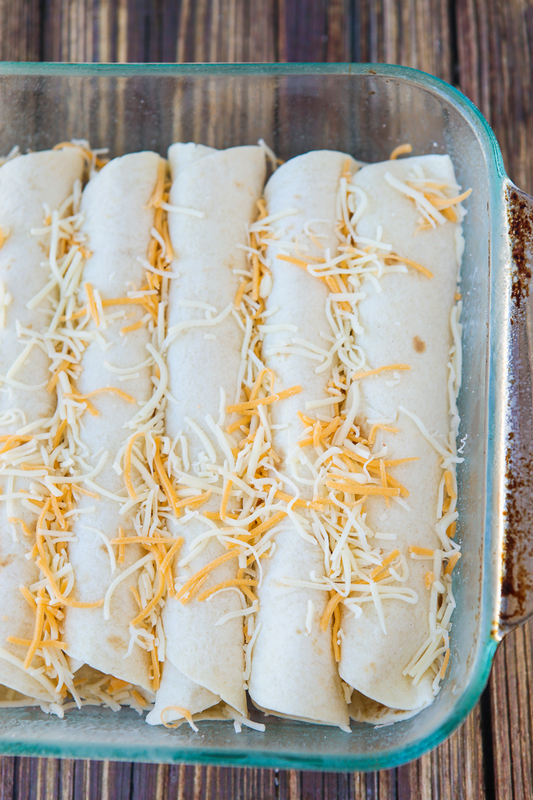 These flautas are simple to make. 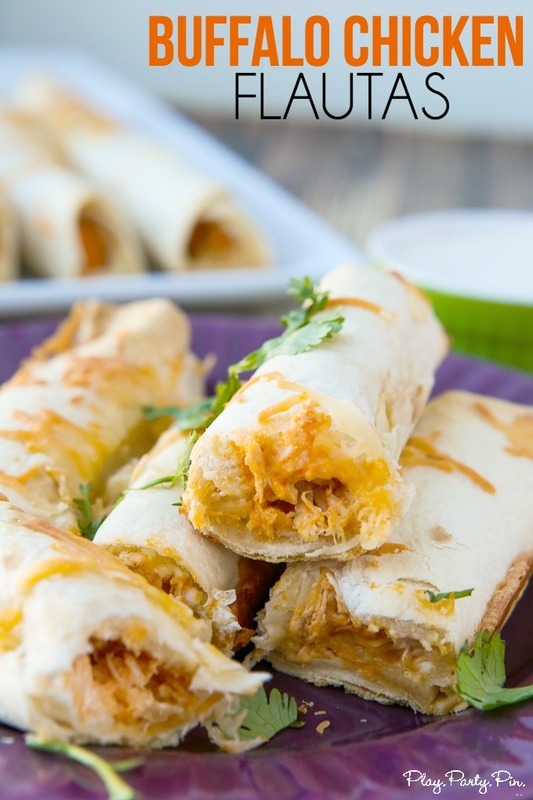 You’re basically going to line one side of each tortilla with the elements of the buffalo chicken dip – a thin layer of cream cheese, some shredded chicken that’s been tossed in buffalo sauce, and cheese on top. Wrap the tortilla up tight and place seam side down in a baking dish. Bake in the oven until lightly browned and crispy. Serve with ranch or blue cheese dressing to help tone down the heat! So easy and the perfect way to spice up your game day. 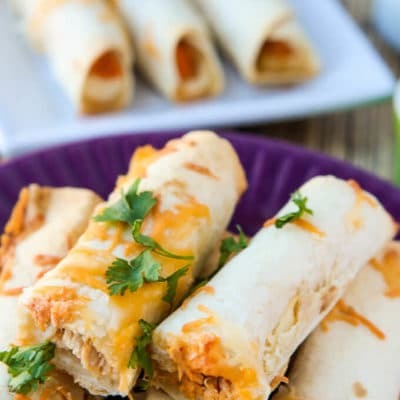 These buffalo chicken flautas include the best buffalo chicken dip wrapped up in a tortilla and baked until crisp! Mix shredded chicken and buffalo sauce in a large plastic bag until well coated. Heat cream cheese in a microwave safe bowl in the microwave for 30 seconds to a minute, until soft. 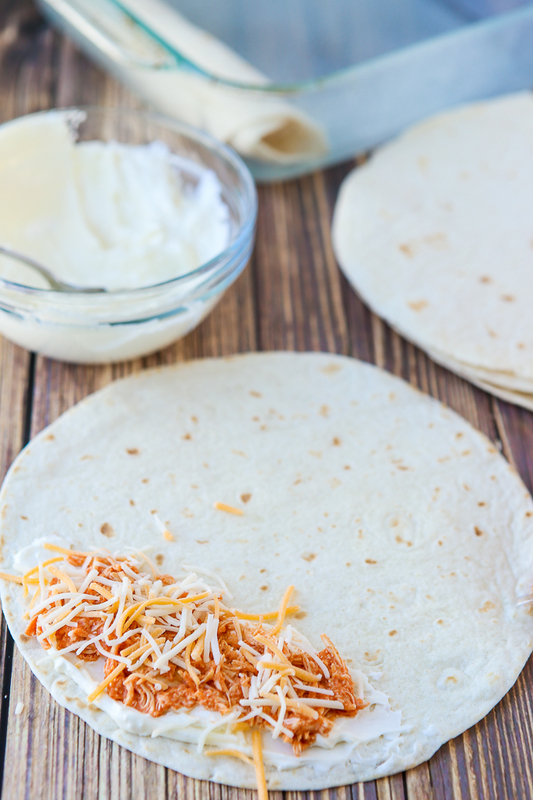 Spread a thin layer of cream cheese on one side of each tortilla, making sure to keep a small border around the cheese. Top with buffalo chicken and cheese. Roll tortillas starting with the side right next to the cream cheese layer. Once rolled, place seam side down in a square baking dish (I used a 9x9 glass dish). Bake in the oven at 350 degrees for 20-25 minutes or until browned. Serve hot with ranch or blue cheese dressing.